The Great Shefford Observatory is a private astronomical observatory situated in West Berkshire, England, about 60 miles west of central London, run by me, Peter Birtwhistle. The observatory has been fully operational since 26 May 2002 (see our first light image at right) with a 12" diameter telescope and electronic camera (CCD). A programme of astrometry was started on 30th May 2002. Observatory code J95 was allocated to Great Shefford Observatory by the Minor Planet Center in June 2002. In June 2005 the 12" telescope was upgraded to a 16" and in September 2005 the CCD was also upgraded, allowing fainter objects to be detected. cometary astrometry, concentrating on the fainter objects that don't get quite so much attention as many of the brighter objects. Other objects are also imaged, including Gamma Ray Bursters, Supernovae, some unusual man-made satellites and deep sky objects. Please have a look around and see some of the things I've been doing and check out the What's new page for recent changes. 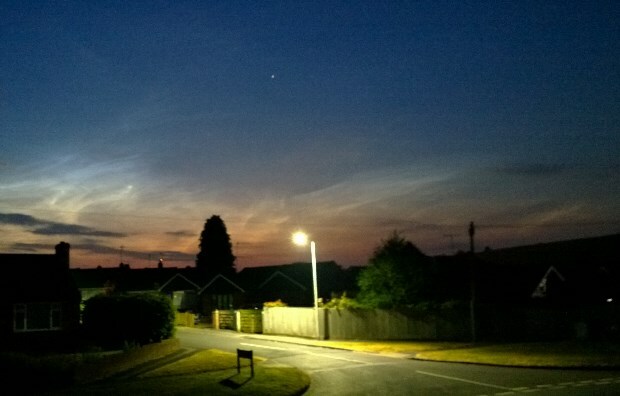 After an observing run on 6th July 2018, 2h 20 min after local midnight and with twilight already strengthening, some noctilucent clouds were visible low to the north. The Sun was 10.5° below the horizon, 1.5 hours before sunrise. Capella (Alpha Auriga) is in the upper centre, above the street light. Operations at Great Shefford Observatory are supported in part by the Planetary Society via the 2005 Gene Shoemaker NEO Grant and by the British Astronomical Association via the 2005 Ridley Grant.